October was a ridiculously busy month and little time for blogging. Here’s a version of the latest article from our Parish Magazine, reflecting on the summer gone on this rather grim November afternoon! There’s been a definite dark side to my planting this year. I’m not quite sure why but I seem to have been veering away from pastel shades and focusing on plants with either dark flower or, at the very least, ones that are deep and rich in colour. 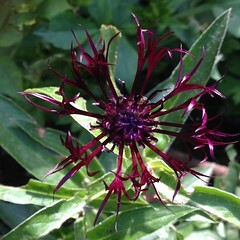 It only really registered with me in early summer when Centaurea Jordy came into flower. I planted this last year but, as a young plant, it only produced three or four flowers, whereas this year it flowered fairly consistently during May and June. It’s such a dark purple that it’s almost impossible to photograph. The common name for Centaurea is ‘Knapweed’ which always reminds me of a childhood favourite TV programme – remember The Herbs and Constable Knapweed?! I always love anything purple but what colour do you call this? I planted these dahlias in the spring, starting them off in pots to establish them before the slugs and snails could have their way with them, and then transferred them to the border where they have been flowering consistently since the end of June. 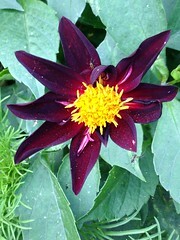 Of course now I can’t remember what they are called but I’ve just discovered the most marvellous search option on the website of the National Dahlia Collection and I’m pretty sure that these are Dark Desire. I searched through several photos that I’d taken of them and none really shows their true colour and most give the impression that I’ve used flash when I haven’t! 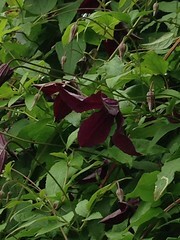 I’m sure it won’t surprise you to learn that I have several purple clematis but a couple of them are very dark, notably Black Prince and Niobe. Niobe is a spring flowering clematis which seemed to do particularly well this year, presumably because it was rather wet! 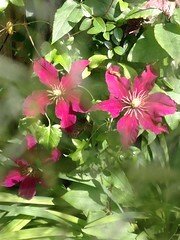 It is the classic clematis flower shape. Niobe herself was a character in Greek mythology who came to a rather sticky ending when Zeus apparently turned her to stone! Hopefully plenty of water, and spring prune and an occasional feed will keep ours in a somewhat happier state! Black Prince is a complete contrast to Niobe as it is a huge climber which gets cut back hard every spring, and I mean hard, within a foot of the ground! Within days it’s usually fighting back and heading for the skies, scrambling first up an obelisk and then into the birch tree! Again, I’m guessing due to the wet Spring, it seemed particularly vigorous but, not only did it climb spectacularly well, but it was covered in hundreds of delicate nodding blooms from late June until the middle of August. Finally I’m going to mention dark foliage and I’m not going to mention the obvious (that would be the dark leaved dahlias that adorn our patio). 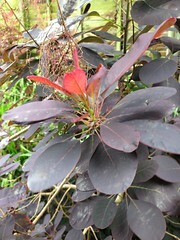 No, I’m going to mention Cotinus Royal Purple – the smoke b ush, which actually produces small yellow flowers whose seedpods then create the strange smokey effect. From a relatively innocent looking plant purchased some years ago, we now have a rather large specimen which is very happy to grow on the shady side of the garden. I am amused to see that the RHS refer to it as a “large shrub or small tree”! Backlit by the sun in the height of summer it is absolutely stunning! Categories: Blog post | Permalink.